ST. IGNATIUS – The Lady Bulldogs logged tied numbers on both Thursday and Friday while the Bulldogs dominated Valley Christian at home. On Thursday, the girls only traveled to Superior to take on the Lady Bobcats, ending 3-3. 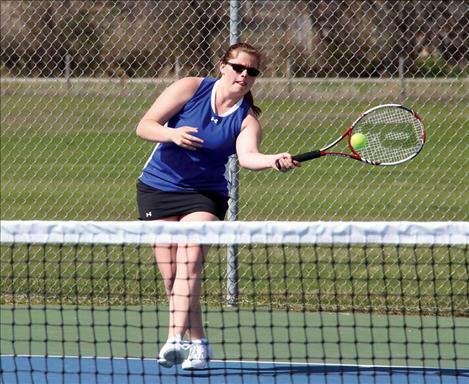 Lady Bulldogs Briar Ahlborn, Kayla Billette, and Daisie VanderBos each won their matches. Friday both boys and girls team hosted Valley Christian with the boys out on top 4-1 and the girls coming in 1-1 for the day. Jamie Mullins posted best scores for the Bulldogs with 6-1, 6-1. Billette won the only Lady Bulldogs match. Mission will split up May 10 with the Bulldogs heading to Missoula to challenge Loyola-Sacred Heart and the Lady Bulldogs will head to Superior to compete in the Best of the West meet. Singles – Briar Ahlborn (Mis) def. Hailie Bahm (Sup) 6-1, 7-5; Kayla Billette (Mis) def. Heather Kelly (Sup) 6-2, 6-7(7), 6-2; Daisie VanderBos (Mis) def. Sophia Williams (Sup) 6-2, 6-3; Brittney White, (Sup) def. Hannah Vaughan (Mis) 8-3. Doubles – Geneva Plakke/Alise Rutherford (Sup) def. Hannah Vaughan/Lina Koethke (Mis) 7-5, 7-5; Sammi Francis/Mackenzi Spence (Sup) def. Allie Koserbek/Julia Gisell (Mis) 7-5, 5-7, 10-6. Singles – Kayla Billette (Mis) def. Lianna Sweet (VC) 6-2, 2-6, 6-2. Doubles – Holly Lewis/Libby Lichte (VC) def. Hannah Vaughan/Lina Koethke (Mis) 6-3, 4-6, 1-6.